Expedition Bolivia » Education » Intro. Knowledge is continuously gained through both personal and environmental experiences. Experiential learning is a philosophy of education that aims to tie concrete lessons with abstract learning. By enlisting the latest technologies i2P takes experiential learning to another level by linking world-class adventurers and extraordinary expeditions to the classroom. This 21st Century program offers a spontaneous and interactive learning environment that ties real life adventures to a standard curriculum in a manner that will inspire students and teachers alike. In honor of the International Year of Chemistry (see: iyc 2011) i2P will take the principles of chemistry out of the classroom and into the laboratory of the natural world. Chemistry is the science of matter, and how matter changes in different environments and conditions. Bolivia's Salar de Uyuni, nestled high in the Andes Mountains, is an ideal location to explore the world of chemistry. The largest salt flats on Earth, the Salar is a lake which is covered with a crust of salt up to 10 meters thick, strong enough to support vehicular travel. Below the crust lies a lake composed of water, salt, magnesium and over half the world's lithium reserves. The Salar, which is ten and a half thousand square kilometers in area, is the flattest location in the world. Adjacent to the Salar are a series of lakes filled with magnesium, sulfur, manganese, boron, copper and arsenic. At an elevation of almost 12,000 feet, the change in atmospheric pressure impacts how matter and chemical reactions behave in this environment, providing a unique opportunity to teach the fundamentals of chemistry. In partnership with Simon Fraser University and the International Year of Chemistry, i2P will conduct a series of experiments in this remarkable environment that will bring the principles of chemistry alive. These experiments, conducted under the supervision of a chemistry professor that is joining the expedition team, will be broadcast live to participating schools and posted on the i2P website. 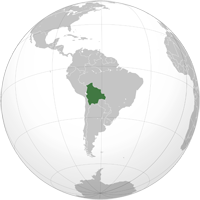 An introduction to the country of Bolivia, the Salar de Uyuni, and the International Year of Chemistry. A discourse on the history of chemistry from its birth in Egypt 5,000 years ago, to the advent of Alchemy, the search for the philosophers stone, and the development of the particle theory of matter. A look at all the naturally occurring elements found in abundance in and around the Salar de Uyuni - Sodium, Chloride, Lithium, Arsenic, Sulfur, Magnesium, Manganese, Copper, Lead and Boron. The unique properties of these elements will help illustrate atomic theory, the development of the periodic table, and modern chemistry. An investigation into the chemistry that underlies the creation of life. What is it about the elements hydrogen, oxygen, nitrogen and carbon that allow them to form compounds that are the cornerstone of all earthy life processes? Curiously, the Salar is almost devoid of life. What does this tell us about the chemical processes needed to support life? How do chemical processes enable living organisms to function? By observing the activity of the i2P team as it runs across the Salar, we will examine what chemically occurs in the body that allows it to undertake a complex activity like running. How is body chemistry influenced by the unique environment of the Salar which lies at 12,000 feet above sea level, is very dry, and can be very cold in May when the expedition takes place. It will take a great deal of energy to run across the Salar de Uyuni. Food will fuel every step, but how do human convert food into energy? Laws of chemistry that explain how energy is used by the human body also explain all energy systems in the world. Chemistry helps us understand that energy cannot be created or destroyed, only converted from one form to another. It also demonstrates that just as humans will die without the energy of food, so the natural world always proceeds toward a degraded state of randomness. If the tendency of the natural world is toward a random distribution of all matter, then why is half the world's lithium found in the Salar de Uyuni? Daily chemistry experiments that employ the natural elements of the Salar de Uyuni to illustrate basic principles of chemistry. These experiments will be lead by Dr. George Agnes, chemist and faculty member at Simon Fraser University. Daily video blogs from the four Youth Ambassadors. A daily quiz linked to the chemistry curriculum. Daily webcasts that link the expedition team to participating schools, and allow school children to interact live with expedition team members. impossible2Possible is a 501c3 non-profit organization dedicated to advancing the field of experiential learning. We achieve our mission by directly involving youth in extraordinary expeditions, and communicating the experience of these expeditions to a larger student audience through our free web-based education program. i2P has staged successful experiential learning expeditions to the South Pole, Baffin Island, Sahara Desert and the Amazon Jungle. For more information please see our website (impossible2possible.com).